I can think of nothing more satisfying than a big bowl of mussels, a glass of delicious beer and crispy french fries. Fans of Goose Island beer are specifically in luck because Bistro 110 is hosting a Beer and Mussels Tasting event this Thursday from 6:30-8:30PM for only $25 per person. 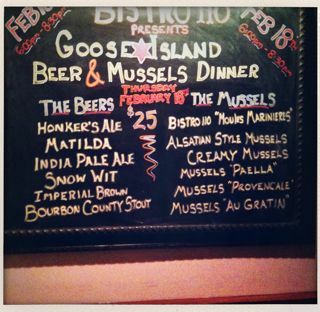 This event includes 6 different Goose Island beers, including my favorites Matilda and Snow Wit paired with 6 different preparation of mussels. Goose Island Brewmaster, Greg Hall will also be on hand at the event. Reservations are recommended but not required.